Last Wednesday, the Joya Executive team ventured into conducting Joya’s first Facebook live event in the Joya lounge in Managua, Nicaragua. For this occasion, the team formed by Juan Juan Ignacio Martínez, Ivan Gutierrez and Carlos Zuniga smoked a Joya Black. 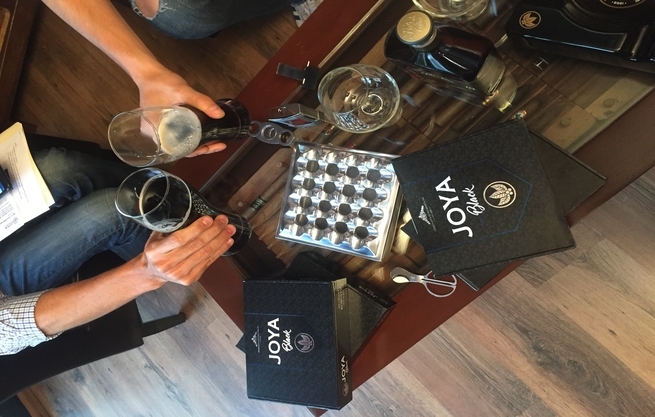 Juan Ignacio, Joya’s Executive President paired his Joya Black with an 18-year-old Flor de Caña Centenario rum. Carlos, Joya’s Creative Director and Ivan, Joya’s Marketing Manager enjoyed dark local craft beer: Moropotente, El Lado Oscuro. Do you feel there’s a parallel between great wines and great cigars? And what I mean is that with a great wine or great cigar, you get that sense of history which is what I get with a Joya cigar. It may just be my experience, but it seems difficult to get the Clásico in the U.S. Is that the case? Also, can you guys discuss the primings used in the Joya line and compare them to your traditional lines? In your opinion what vitola profiles the flavors of Joya Black the best? We also got a comment saying that they enjoyed the background music. If you’re interested in listening, it’s by a Nicaraguan artist called SACASA. Watch the rest of the video on Facebook or YouTube to find the answers. Did you like our Facebook live event? Do you want to see more of this type of content? Let us know in the comment section below!